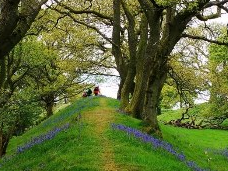 The 21st Walking Festival will be held in May, when the countryside is at its best. Our guided walks are led by experienced local volunteers and offer a great choice of walk length and terrain. A walker’s paradise, footpaths lead over hilltops, through winding valleys, tiny hamlets, lanes and remains of ancient hill forts with pretty impressive views! Walks are informal and friendly, often ending in a café or pub.